An electric smoker offers plenty of convenience for those looking to cook and preserve their food with the power of smoke at home. While charcoal smokers and traditional barbecue pit smoking produces the tastiest results, they require more work than the set-it-and-forget it convenience of an electric smoker. Finding the best electric smoker for your home means reading reviews, studying product features, and diving into the ins and outs of available attachments and configurations. With the right electric smoker, cooking and preserving your own foods at home can become a quick, over-and-done with task. We reviewed dozens of electric smokers to identify the best of the best, based on Amazon reviews, how well they performed in reliability tests, cost, and other considerations. We narrowed our search down to 5 of the top-rated electric smokers home cooks can purchase to ensure a perfect result every time. Digital controls and plenty of cooking space make this smoker suitable for all experience levels. We’ve identified Masterbuilt 20070910 30-Inch Electric Digital Smoker as the best electric smoker out there. With 730 square inches of cooking space and digital temperature and timer controls, this electric smoker is suitable for smokers of all experience levels. These benefits allow you to create a perfect result every time you use it, with very little cooking knowledge. 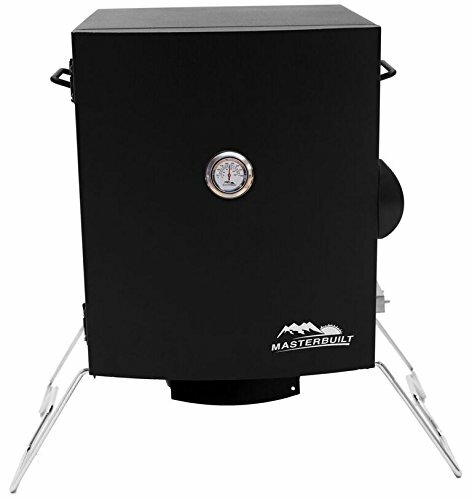 The Masterbuilt 20070910 30-Inch Electric Digital Smoker took the top spot on our list of the best electric smokers thanks to its generous cooking space, powerful 800 watt heating element, and easy-to-use digital temperature and timer controls. The side loading wood chip compartment means you don’t have to open the door in order to top up your chips, and the removable drip pan makes cleanup a breeze. Those who purchased and reviewed this electric smoker appreciated that it required very little in the way of assembly and setup, and found that it was easy to use – especially for those with little to no food smoking experience. While the convenience of caster wheels is nice for portability, some people reported they weren’t overly sturdy. With a price tag of around $239, it doesn’t come cheap, but it isn’t wildly expensive either. Plus, the quality craftsmanship associated with the brand, as well as the ease of setup and use more than justifies that price. It has a rating of 4.0 on Amazon with more than 4,700 people reviewing it, which we think goes a long way in convincing home cooks to make the investment. 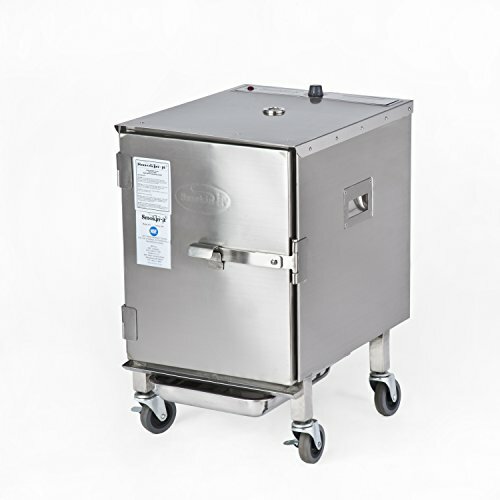 A large capacity smoker that’s certified for restaurant use. The Smokin-It Model #1 Electric Smoker took the runner-up spot on our list of the best electric smokers because even though it has been certified for restaurant use and can hold up to 22 pounds of meat per load, it comes with a less powerful heating element and fewer racks than our top pick. The rubber caster wheels on this unit are more sturdy than our top smoker, if portability is important in your purchase decision. It boasts a durable 8 gauge stainless steel construction, and comes complete with integrated side handles for lifting and moving. 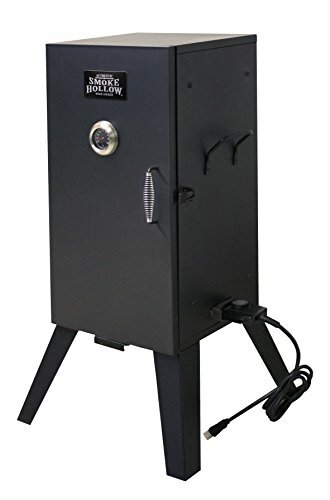 Those who purchased and reviewed this electric smoker appreciated that it is made in the USA, and commented that the materials and construction seemed very strong. Even those with very little smoking experience found they could use this machine without difficulty. At a cost of about $310, it doesn’t come cheap, but the quality craftsmanship associated with the brand, as well as the ease of setup and use more than justifies that price. It has a rating of 4.6 on Amazon with more than 125 people reviewing it, which we think goes a long way in convincing people to make the investment. The Smoke Hollow 26142E Electric Smoker is an ideal choice for those looking for an electric smoker option that won’t break the bank. It boasts a powerful 1500-watt heating element, with fully adjustable temperature control for perfect results every time. Included are two height adjustable chrome-plated cooking grids, as well as a porcelain-coated water pan, and porcelain-coated chip tray. Those who purchased and reviewed this electric smoker appreciated the 1.3 cubic foot cooking capacity, and compact design. People said it was easy to set up and use, and delivered consistent results. Some reviewers commented that the drippings weren’t always caught by the included tray, so they needed to place a layer of foil under the meat in order to prevent grease buildup. With a price tag of approximately $112, this electric smoker is a solid choice for those looking for an electric smoker option on a budget. It has a rating of 3.7 on Amazon with more than 200 people reviewing it, which we think goes a long way in convincing home chefs that this budget-friendly pick is just as good at smoking foodstuffs as its more expensive counterparts. A compact and lightweight design lets you smoke on the go. The Masterbuilt 20073716 Portable Electric Smoker is a solid choice for those looking for an electric smoker option that is also portable. Perfect for picnics and other away-from-home gatherings, the collapsible legs easily fold under the unit during transport and for storage, while the side carrying handles make for convenient portability. Choose from high, medium, and low settings, and keep track of the internal temperature thanks to the large temperature gauge on the door. Those who purchased and reviewed this electric smoker appreciated that while it is a simple unit in terms of controls and features, it still delivers good, consistent results. Since the unit doesn’t include a drip tray, reviewers found it helpful to line the bottom rack with foil so that the heating element wasn’t being directly splashed with grease. At a cost of around $175, it’s not overly expensive, and the quality craftsmanship associated with the brand, as well as the ease of setup and use more than justifies that price. It has a rating of 4.3 on Amazon with more than 150 people reviewing it, which we think goes a long way in convincing home chefs to make the investment. A smart smoker for the ultimate in set-it-and-forget-in cooking. The Masterbuilt 20072115 Bluetooth Smart Digital Electric Smoker takes the art of smoking to a whole new levels thanks to the integration of Bluetooth controls, which lets you control your smoker with a cell phone or tablet. It boasts 721 square inches of cooking space, and comes complete with four chrome-coated smoking racks. The 800 watt heating element provides consistent smoking temperatures of up to 275 degrees F.
Those who purchased and reviewed this electric smoker appreciated that the size of this unit was more than sufficient, and that the brand’s customer service was very helpful when needed. While users found that the Bluetooth control was a cool feature, the limited range was a big drawback. Most people, however, could operate this smoker manually without any complaints. With a price tag of about $375, it doesn’t come cheap, but the quality craftsmanship associated with the brand, as well as the added convenience of Bluetooth control more than justifies that price. It has a rating of 3.9 on Amazon with more than 300 people reviewing it, which we think goes a long way in convincing home cooks to make the investment. An electric smoker is an ideal choice for those who want to be able to smoke their own foodstuffs at home. They make an excellent option for home cooks who enjoy the flavor of smoked foods, but don’t have the time or knowledge base to devote to smoking in the traditional manner. With an electric smoker, temperature, smoke, and time are all very easy to control, which makes achieving quality results consistently a cinch. Electric smokers are also fairly compact, generally easy to move, and require very little in the way of maintenance. If you have a unit that is well insulated, you can even easily smoke during the colder winter months. While some meat-cooking enthusiasts swear that there is no substitute for real live fire when it comes to smoking meat, for the average home cook, an electric smoker is more than sufficient for safely cooking and adding a smokey flavor to their foods. You should also check out our reviews of the best pressure cookers and the best crock pots for more convenient appliances that make home-cooked meals a breeze. Size. One of the most important considerations when it comes to choosing the best electric smoker for your needs is size. If you’re hoping to smoke a whole turkey but your smoker can only accommodate a chicken, you’ll end up disappointed. Along with size, the number of racks a smoker comes with is another important factor. Racks let you smoke more food in the same amount of space, and should be made from durable metals for added longevity. If the racks can be height adjusted, even better. Controls. The next most important consideration when buying an electric smoker is the controls. Some smokers allow you to adjust the temperature by degrees using a knob or digital controls, while others simply offer a choice of low, medium, and high settings. If precision cooking is what you’re going for, a digital electric smoker is your best bet, but will be more expensive than basic models. Power. For most electric smokers, a heating element with about 800 watts of power should more than suffice. Larger smokers should have elements that are at least 1200 watts of power or more. Accessories. Wood chip trays, water pans, and grease trays are all invaluable extras to look for in an electric smoker. Other smart features to look out for are stay-cool handles, chip trays that can be loaded without opening the smoker door, and cold smoking kits. Bluetooth/WiFi. While not a must for everyone, there are some home cooks who like the convenience of being able to control and monitor their smoker from their mobile device. A number of smokers on the market are available with Bluetooth/WiFi connectivity, but it’s important to keep in mind that your device must be within range in order to work properly. You can’t control your smoker from your cell phone while you’re out at the grocery store! Portability. If you’re not planning on leaving your electric smoker out all year long, being able to easily move it into the garage or home is an important consideration. Some models have caster wheels for rolling the unit, while others feature side carrying handles for ease of portability. Price point. Finally, consider how much you are willing to spend on an electric smoker. Electric smokers vary in price from $100-$500 or more. What is an electric smoker and how does it work? An electric smoker is a type of food smoking device that uses electricity rather than live fire in order to smoke the foods within it. Some models use a rheostat to control energy output and temperature, while other models have digital or manual temperature controls. Some models allow you to adjust the temperature by degrees, while others simply offer a choice of low, medium, and high settings. The smoker will have a tray or basket for wood chips, which creates smoke for cooking, and imparts that iconic smokey flavor into the foods. Once you’ve set the temperature, the element begins heating the box, and smoldering the wood chips. When the food reaches a safe temperature and is fully cooked, it’s ready to enjoy. Do electric smokers cook faster? An electric smoker does tend to cook faster than propane, charcoal, or other live fire smoking methods. This is because there is no combustion taking place in an electric smoker, and as a result there is less airflow through the cooking chamber cooling the space down. Because electric smokers offer a consistent temperature, they are very easy for newbies to use and offer consistent results. How hot does an electric smoker get? An average electric smoker ranges in temperature from about 100-275 degrees Fahrenheit. There are some smokers available on the market that exceed this limit, with a few models boasting temperatures around 325-350 degrees. As far as cooking methods go, smoking is generally of the low and slow variety. How long does it take for an electric smoker to heat up? It takes an electric smoker about 30-45 minutes to come to the set cooking temperature, on average. Some models ask that you preheat the unit before adding your foodstuffs, but others recommend against preheating. Always read and follow the manufacturer’s instructions. We looked at 20 other electric smokers. Even though they didn’t make our 5 best electric smokers list, they’re the best of the rest and each is still a great option for those who want to smoke their own food. The information you’ll need to compare each one is included with the listing. This WiFi-enabled electric smoker allows you to easily monitor internal meat temperature, cook time, and chamber temperature over WiFi thanks to an app. This Bluetooth-enabled electric smoker provides 780 square inches of cooking space, and comes complete with six cooking racks. Plenty of optional accessories let you become the smoke master. This WiFi-enabled electric smoker boasts a lightweight and compact design that is ideal for use at home or out and about. The app sends alerts to your phone so you always know the status of your food. This Bluetooth-enabled electric smoker features an easy-to-use digital control panel with sun shade, and an internal light so you can easily check on your food in all conditions. This digital electric smoker provides 721 square inches of cooking space, and uses a powerful 800 watt heating element. It comes complete with four chrome-coated racks and an easy-to-read top LED display. This digital electric smoker boasts insulated, double-walled construction that makes it suitable for use year-round, and provides 725 square inches of cooking space on four adjustable cooking racks. This digital electric smoker provides 730 square inches of cooking space with a fully insulated smoker body. The top-mounted digital control panel makes getting perfect results easy as pie. This digital electric smoker boasts top-mounted temperature and time controls, and even offers a quick smoke option for when you’re short on time. Its 3.0 cubic feet of cooking capacity can easily handle a variety of meats. This digital electric smoker boasts a large, easy-to-read push-button digital control panel with LED read-out, and comes complete with three porcelain-coated cooking racks. This digital electric smoker offers 730 square inches of cooking space, and comes complete with four adjustable and removable chrome-coated cooking racks. It comes with an RF remote so you can make temperature adjustments without getting up. 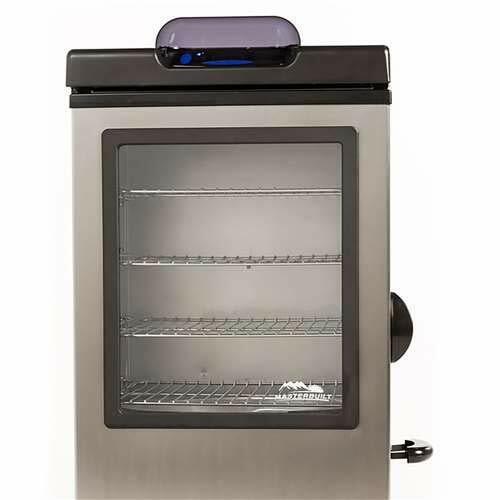 This digital electric smoker provides full digital control for temperature, time, and smoke, and comes complete with four cooking racks. It is ETL and CE listed for added safety peace of mind. This digital electric smoker lets you easily control temperature and time with just the push of a button, and comes complete with four chrome-coated smoking racks. 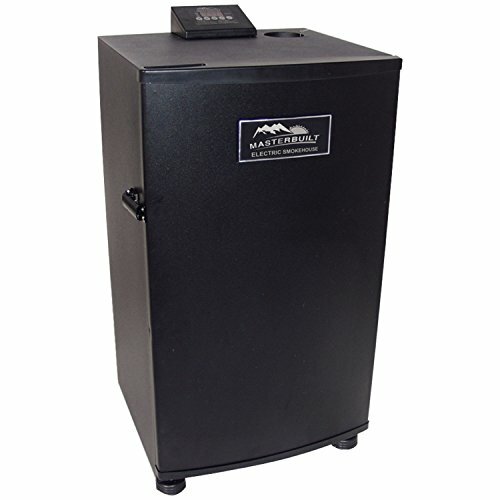 The fully-insulated smoker body helps to retain heat and save energy. This digital electric smoker provides 732 square inches of cooking space, and comes complete with four chrome-plated steel cooking racks. It features a side access wood chip loader to help minimize smoke and heat loss. This digital electric smoker boasts a large control panel with LED read-out, and comes complete with five porcelain-coated cooking racks. It provides 1008 square inches of cooking capacity. This portable electric smoker lets you quickly and easily infuse smokey flavor into food and beverages. Its lightweight and compact design makes it suitable for use at home or while out and about. This portable electric smoker provides 490 square inches of cooking space, and comes complete with chrome-coated racks. The two side handles make for convenient portability, and it includes a full-length cover. This portable electric smoker boasts a compact and lightweight design with fold-in legs and side carrying handles for ease of portability. It comes complete with two chrome-coated smoking racks. This portable electric smoker boasts 395 square inches of cooking space and a powerful 1,650 watt heating element. It comes complete with two porcelain-coated smoking racks, a removable porcelain-coated wood chip tray, drip pan, and water bowl. This portable electric smoker provides 443 square inches of cooking space, and comes complete with three chrome-plated cooking grids. The 3-in-1 tray holds the water pan, wood chip box with lid, and grease tray in one component for added convenience. This portable electric smoker boasts 548 square inches of cooking space, and features a lightweight design for easy transport. It comes complete with three chrome-plated racks, and a built-in thermometer on the front door.